Nerds With Kids: Free Comic Book Day 2009: All Things Fun! Free Comic Book Day 2009: All Things Fun! If you're a shop owner it's easy to give away free comic books. Just set up a card table in front of the store and spread ‘em out. Done. But a lot of shop owners know they can’t let the comics themselves do all the work. Even The Fist Of Justice needs some help. Enter Ed Evans of All Things Fun, located in South Jersey. For starters, Ed’s not content with keeping FCBD contained within his store. He and his wife, Dina, are grabbing their long boxes and taking it out to the people. They set up separate events at three - count 'em three! - different libraries. My wife and I came out of the publishing industry and children's literacy is an important cause for us. 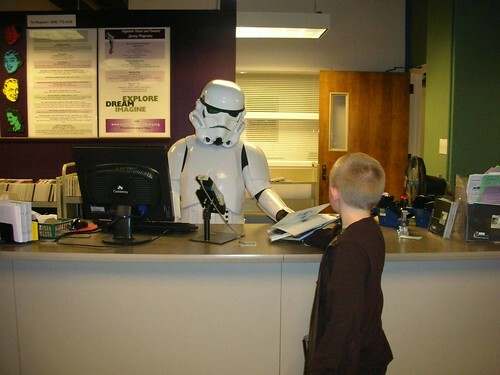 We donate hundreds of books for the events and with two of the libraries we also arrange for Troopers from Vader's 501st to come and visit with the kids before we transport them to the store. Meanwhile, what’s going on at the store? We see a lot of folks that only come out on FCBD or make the circuit of stores that give away free comics. But we also will see regulars bring family and friends that may not understand what the whole"comic" thing is about. The most common comment we hear from folks on FCBD is that they didn't realize comics could be so much fun. And that the comic retailing has changed so much from when they were children. Now it’s always been my impression that it’s hard to pull any “normals” into a comic shop. Do you see any new faces? As I mentioned before the mix is all over the place. We expand on FCBD and make it a real celebration. Yes, you get free comics but you can also join in the fun of learning a new game, meeting local artists, getting your picture taken with Star Wars characters and/or take advantage of a huge sale. While FCBD is an outreach program we may not see the full effect since we already carry a wide range of products. So while we may not see many new faces we may see game or toy customers taking a fresh look at comics thanks to FCBD. Comics and graphic novels are great tools in libraries and schools in regards to helping younger reluctant readers. If you can get the right comic into the right kids' hands you can change a young person's life. And if you think I'm kidding, think back to your first comic. Most comic fans remember their very first book and how it thrust them into a whole new world of adventure (and into the hobby). How cool is it to be the guy that handed you that first book? Get all the info about All Things Fun's Saturday events HERE. Thanks for the kind words! We had a great FCBD. Between the 3 libraries and the store we gave away thousands of free comics. I hope your readers managed to get some of the free goodies!